With entwined chaos and a compelling attack, E offers plenty of intensity to enjoy on Negative Work. Noisy rockers Thalia Zedek (from Come, Uzi, and Live Skull), Jason Sanford (Neptune), and Gavin McCarthy (Karate) came together a couple years ago for a self-titled album that blasted away an anxious time. The two guitars and drummer McCarthy fired heavy rock shots into the darkness, turning frantic sounds into a propulsive ride through the shadows. 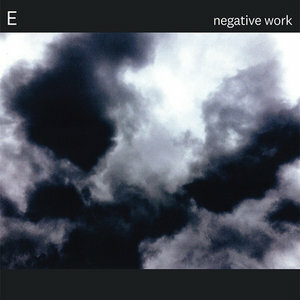 Their follow-up album Negative Work drives deeper into the cave. Little light penetrates here, but the group's ability fit chaotic parts together makes for a compelling attack. "Are you worried?" sings Zedek on "The Projectionist". "I don't care!" Zedek and Sanford proceed to exchange vocals, Sanford's baritone questioning perspective, turning images around like a projection or, better, an eye. Zedek eventually admits, "We are coming from the shadows / We are running from our shadow." The mixed of distorted guitar textures and pointed, jabbing lines combine with McCarthy's high-energy drumming to create an apt unsteadiness. Much of the album follows this model; the singers go somewhere dark while the music fills in the shadows (or, at times, blows it all up). Regardless of where the music goes, the lyricists follow a downward spiral. Much of the discs lives in uncertainty. "Poison Letter" has as many question marks as thoughts, and neither the speaker nor the spoken to seem to understand what's going on. "I don't know / Does it show?" epitomizes the track, with nervous guitars edging around endless corners. Negative Work doesn't shift through ambiguity or paradox, but simply dives into epistemological voids. In this world, there simply aren't satisfactory answers. This turmoil leads to dismay and darkness. Even a track like "A House Inside" that might seem to offer hope instead only provides a ghostly place to hide. That track shows the title idea at work: the band restrains itself, leaving space to build the mood rather than guitar fuzz or drum fills. The gloom because ominous in its emptiness, Sanford's explanations taking on grim tones as the song patiently works itself up and down, twitchy but unreleased. The album closes with one of its finest tracks, "Hollow". Zedek and McCarthy swap vocals, offering a state of the union that doesn't find anything comfortable. Zedek describes the "hollow" of the song as a geographical spot that stands in for a mental state, the uncertainty of the album reaching its peak in a human condition. McCarthy explains that we have to sign away our lives for what we need, but we get only lies in return. Zedek articulates these lies as the vapidity of the idols of mass culture and the comfort of being a hollow follower. The track's sonic structure allows the three musician to interweave their parts, and the guitar interactions stand out here as the whole facade slowly gives way to squeals and moans, eventually a repetition that has no resolution except to give way. E's previous release didn't rely on bright spots, but Negative Work finds a way to go even darker. The trio have sharpened their interactions a little, and they've pushed further into unease. Early in the album, Zedek sings, "You know I know," and then spends the rest of the disc undoing any chance of functional knowledge until the disc becomes a warning against the hollowness of contemporary life. There's little to hope for here unless it can be found simply in the uncovering of the darkness, but nonetheless there's plenty of intensity to enjoy.